Certainly not the first high profile black woman to grace the cover of vogue, but she is the first black female athlete. Serena Williams, joins the ranks of Beyonce, Michelle Obama, Rihanna and Lupita Nyong'o as black celebrities who have made the cover of this fashion iconic magazine. 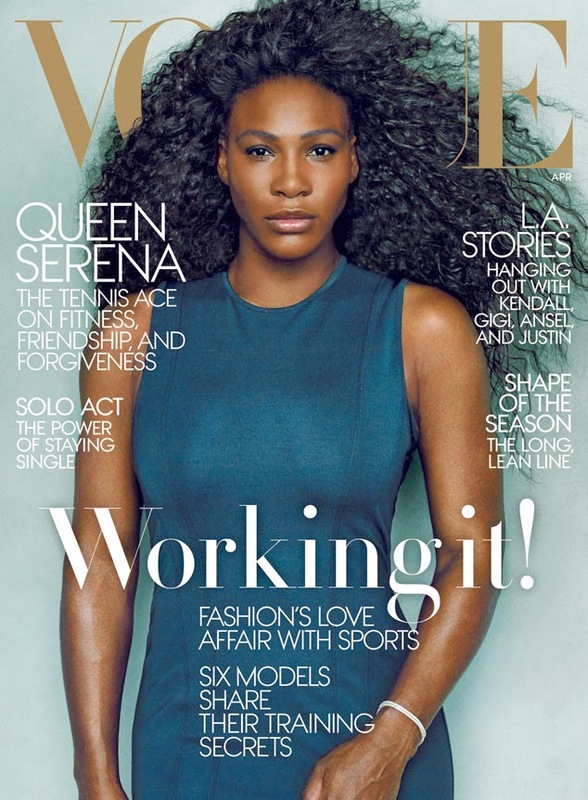 Serena Williams is the first black female athlete to land a solo cover of Vogue, and the tennis pro looks absolutely breathtaking (she last fronted the magazine for the June 2012 issue alongside Ryan Lochte and Hope Solo). Serena sports long natural curls and a slim-fitting blue sheath dress on the cover, finishing her look with minimal makeup and a simple tennis bracelet (natch). Famed photographer Annie Leibovitz shot the stunning spread, which also features tennis star (not to mention Serena's best friend and top competitor) Caroline Wozniacki. Read More on E! Vogue's April issue hits newsstands on March 25, and we can't wait to get our hands on one.